Leaving the Stratford on Avon canal at Kingswood jct. we turn right and right again onto the Gd. Union. 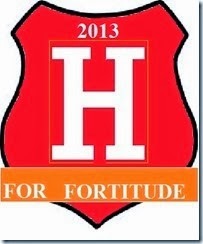 The junction is shaped like an H so we have come up the lower left leg of the H and across and down the lower right leg that goes all the way into London but that`s not our destination as the year is still young leaving plenty of time till my annual pilgrimage south for christmas. 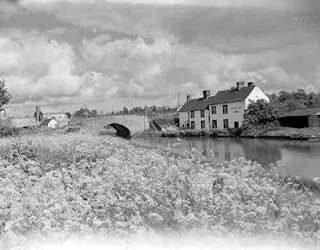 Just a couple of miles south is Turners Green where the canal is built on an embankment and makes a nice overnight stop with views of the countryside on both banks of the canal and very good reception for Sky TV. reached Shrewley Tunnel just 433yds long but as you can see on the roof of the boat plenty of water dripping down through the tunnel roof. Just a few drips so un like some of the tunnels no need for a brolly.... yes a brolly is needed in some as the water gushes down as if someone is standing above with a hosepipe and in the dark you feel it rather than see it. 146ft into Warwick. As we descend we can see the spires of Warwick in the distance. The flight as is usual at this time of year was busy with boats coming up so the descent is made easier as we swap locks with boats leaving the lock ahead which saves us filling the lock and opening the gates. Now if you look at the picture you can see that there are 4 ground paddles to let water in/out and 4 gates, now boats with plenty of crew would use all of these so if they went up or down the whole flight on there own and had to set every lock they would operate 84 paddles and open and shut 168 gates. When we go through we would only use one gate at each end of the lock cutting the gate openings down by half and don`t forget those paddles have to be wound open and then wound shut. days i managed to get a pic of my crew resting, well it was Andy who needed the rest as a couple of days after this pic he reached the tender age of 39.
the roof. The roof had a slight anti slip surface on it but when cruising i spend a lot of time jumping up and down from the roof in locks and found the surface to be not to safe so the solution was to sand the roof. The way i do it is to mask up the panels and while the first coat is still wet sprinkle bird sand over the painted area then lightly brush off the excess and leave to dry before 2 more coats of paint are applied over the bird sand. In the pic above one coat of paint plus bird sand is drying. I have since managed to get the first coat on to the sand but am now waiting for a dry day to apply the next coat of paint. Above passing the Kayes Arm (left of pic) at Stockton Andy/Tina on `Ytene` bringing up the rear. The name comes from the quarry`s here abouts that produced Blue Lias stone some of which was used on the R. Thames embankment also St Michael`s church in Stockton village. 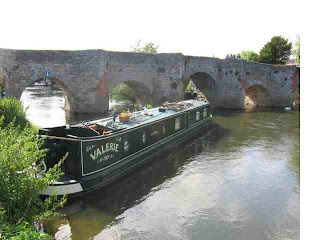 So heading to Braunston for the w`end so untilnext time bye. Although I didn`t get to see much of the R. Avon I must say I did enjoy the short trip to Bidford. So I have put the few snaps i took on to the photo album below. Have spent this w`end with Andy/Bev and g`children Jack&Jordan and this has helped me get over the ordeal of the past weeks. Just a quick blog to show you what this life is all about. 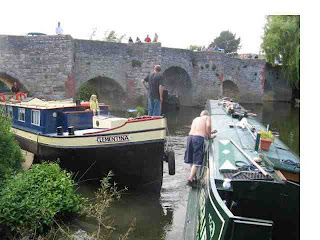 Having left the hustle and bustle of Stratford the above pic shows our first o`night mooring. Not a fantastic view but to sit on the front deck in the middle of the countryside with the only noise being the wind rustling the trees is sheer bliss after the last 3 weeks. It certainly has calmed me down and listening to my voicemail where my g`son Jack was telling me about his visit this coming w`end but not quite understanding why i wasn`t answering him made me laugh out loud. I will blog some pics i took on the Avon shortly. 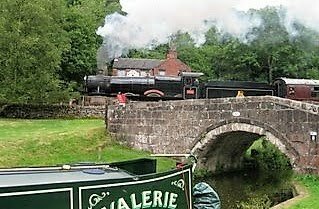 On the 29th July we each paid £50 for a 2 week licence to cruise down the R. Avon as our BW canal licence is not valid on the privately owned Avon. It was a lovely day when we set off cruising with the flow of water making it`s way to the R. Severn at Tewkesbury and in the picture below is Bidford bridge and just through the bridge our first overnight mooring. Andy/Tina on `Ytene` were in front and had moored by the time i arrived so i went through the bridge and moored alongside them waiting for John on `Tui`. Now if you enlarge the picture you can see on the left arch 2 arrows showing the navigable channell, the red no entry on the centre arch was not in place at this time as i took the picture on my way back but even so i think it is plain for all but an idiotic moron not to be aware of which arch to use. In the picture below that i took as i went through the arrows are plain to see and no i`am not heading for the second arch just following the approach to the left arch avoiding some reeds on my left. arch would be nice to cruise through, oh did i mention it was John on `Tui` and as you can see he is well and truly aground as the water under all the arches except the marked navigable one is only about 12 inches deep. So off we set Andy and I to try and pull him back but as the pictures tell the story going through the arch and trying to get in position was not helped by the flow of water coming towards us and i ended up well and truly aground as you can see in the picture below taken on the other side of the bridge. the power and in the picture above no matter what revs i used it was not gonna move. 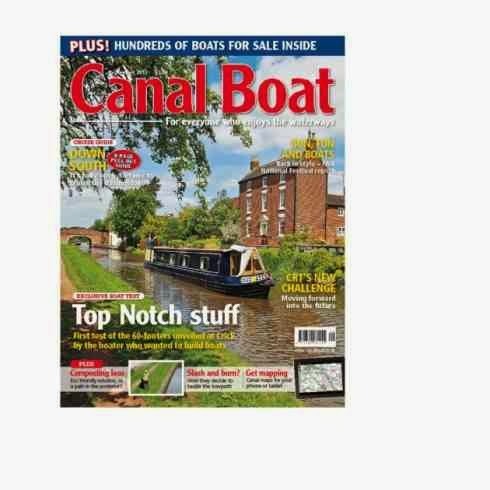 Perhaps in some of the pictures you can see a muppet or even John sitting on the back of his boat with not a care in the world and at one stage drinking a cup of tea so i shouted across and i won`t print here what words i used but the general idea was he should phone a boatyard and get some help. Above and below are pictures of a Dutch barge that arrived from a nearby yard to sort things out but even he had trouble even with his powerful engine and it wasn`t until 4 local lads walked along my boat and standing knee deep in the river used lengths of timber to lever the front off the river bed so that the Dutch barge could push the back end without the front going more aground. 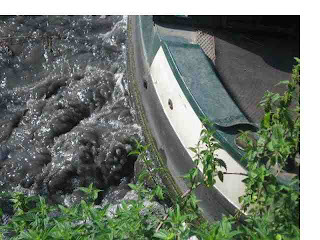 It worked and as the rear of my boat was pushed into deep water i was able to reverse. He then pulled John out of the bridge arch. Alls well that ends well i hear you say, i only wish it was because on mooring up my engine was not sounding to good. To cut the story short it appears that the excessive revving of my engine had damaged the piston rings and with engine removal, gaskets, labour etc i ended up with a bill of £1003. I suppose you must be thinking John must have been beside himself with all the trouble he had caused but you `d be wrong, no thanks for attempting to help him, no asking what the engineer had said after listening to the engine in fact he never said a word but disapeared into his boat when Andy who at the time was standing next to me told him it was something serious, nice bloke eh well it was then and there i decided no longer would i be cruising with him but i needn`t have worried because the following day when Andy & Tina were leaving to attend to some business in Evesham that he decided he was going to head back to London and that was what he did no goodbye or thanks no hope all goes well with the repairs he just left. Well John if you or one of your mates read the blog GOOD RIDDANCE your an ar.....e.
So after getting the repairs done i had been at Bidford 13 days after waiting 3 days for the engineer to find a time slot to start and with parts ordered from Holland and other complications i was ready to leave and catch up with Andy/Tina who had returned to Stratford on Avon as we had decided not to carry on with the planned trip to Gloucester as the heavy rain had caused the Rivers Avon and Severn to run fast. 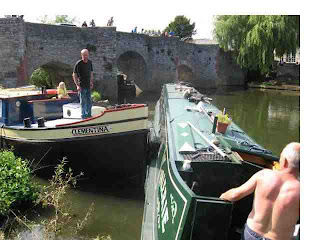 In the picture below is the reason i ended up stuck at Bidford for an extra 2 days, the Avon rose 2` flooding the mooring. So all in all our trip on the Avon has been a nightmare and as i write this i`m back in the Basin at Stratford so just this once the blog is not of past cruising but bang up to date i`m here now but not for long. Although i`m the sort of person who would always try and help anyone with a problem of any sort i think in future i`ll just take a step back and give the matter some thought. While moored up in the basin at Stratford upon Avon I had a visit from Andy/Bev and the grandchildren Jack&Jordan. A visit to the Butterfly farm, which can be viewed on the picture album video below was followed by a ride on the chain ferry pictured below. As you can imagine this was a lovely w`end and after the family had gone home the plan was to go down onto the R. Avon and make our way to Gloucester. Setting off in fine weather i was realy enjoying myself and arrived at Bidford just after Andy/Tina on `Ytene` then John on `Tui` approached the arched bridge and the brainless idiot decided to ignore the arrows indicating which arch was the navigable channel instead he thought the centre arch looked ok but he didn`t make it and become well and truly stuck in the shallow water. The outcome of all this will be revealed on the next blog by which time i hope to have my boat back in service. Well have arrived in Stratford upon Avon in the basin adjacent to Bancroft Gardens. The town centre is just across the basin from the moorings making it easy to visit the many interesting sites along with the thousands of tourists from all over the world. I think the only other place I have heard so many different languages was London. Be warned fellow boaters that to moor here so close to everything has a price and below are pictured 3 tourists taking pictures so i got my own back and snapped them. This goes on all day long with party`s of up to 30 led by a guide and they also stand in the front deck to have their photo taken if the boat has no one aboard. Still it`s a small price to pay for a visit to Stratford and at least the next mooring can if you wish be in a nice remote piece of countryside. While here I had a w`end visit from 2 of the g`children with mum&dad and we visited the Butterfly farm and a ride on the chain ferry across the Avon but that will be on the next blog so in the meantime click on the photo album below and have a look around Stratford upon Avon.